Maj al-Ragath is a Redguard Undaunted who can be found at the enclaves in Elden Root, Wayrest and Mournhold. She is responsible for offering daily pledges. 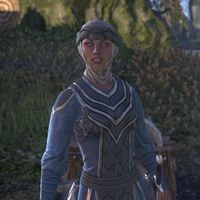 Her mother, Hel Ra'Lala, can be found at the Wayrest enclave. "Make sure you pay your bar tab tonight, Undaunted. Who knows what will happen after we speak tomorrow?" "Most see the glint of gold and get a shovel. Undaunted? We draw steel. That stuff is always guarded. Come talk to me tomorrow, and we'll see what else we can find." "A hard fought victory. Toast the Eight tonight, Undaunted. For tomorrow, you may beg their mercy. Hah!" "There's nothing better than ripping victory out of its tomb and clubbing it over the head. Nice work today. Make sure to see me tomorrow, eh?" "You made us proud today. Now get out of here. You have drinking to do, and I need to get ready for tomorrow." "Nice work today! Get out there, have a drink, and toast the evening stars! Tomorrow brings a new chance to stain the ground with blood." Maj a-Ragath has quite a few things to say once the player has sighed the Undaunted Tome. "You made us proud today." Thank you, I've signed the Tomb. What is the purpose of the pledge? "Our ranks have swelled in recent months, and out coffers are overflowing with jewels and gold. We want to see the spoils go to the best among us." The pledge is how you determine that? "It's a verbal handshake, a...you know what? Go talk to Glirion the Redbeard. He'll tell you everyone you need to know." I'll speak to him, then. "Glirion's a good sort. Just...not too friendly. Doesn't show any emotions, really. Is bloodthirst an emotion? Never mind." "Oh, the usual. Mother robbed tombs for decades in the dunes of Alik'r. She raised me on her hip, and forced me to join the Undaunted with her. It's the sort of thing every daughter has to deal with." Your mother is in the Undaunted as well? "Oh yes, she's a proud member. Goes by the name Hel Ra'Lala. Just don't...you know. Talk to her. She's a mean old bird." Her name is very different from yours. "A funny story. When she was young, some thickskull heard her name and had trouble pronouncing it. Her real name is Hel al-Ragath, just like me. But Ra'Lala stuck, and she's been using it for thirty years." Good talking with you, Maj. The player can return to Maj after speaking with Urgarlag. "Hey there, scrub. You'd best stay back. We are speaking of blood and glory. For we are Undaunted!" I talked to Glirion and Urgarlag. Urgarlag said I should ask you for a key. "Did she now! She must like you. In that case you're going to need all the help you can get! Take your key and come back when you're ready to take the pledge. I can't wait to see what you're made of!" This page was last modified on 1 August 2018, at 02:14.